Features Product image Product image	Windows Server 2012 R2 Standard is a flexible, powerful, and easy-to-use server solution. Whether your company is a small business or a large enterprise, Windows Server R2 2012 Standard can help you cloud optimize your business. 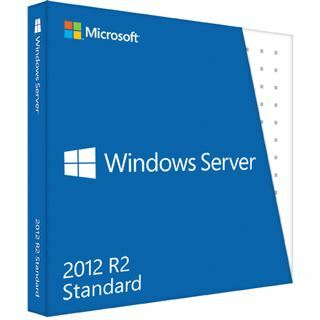 Windows Server 2012 R2 Standard enables you to blend your on-premises solutions with the cloud without having to re-engineer infrastructure, systems management, or applications. It offers customers scalable, dynamic, and multitenant-aware cloud infrastructure that helps users connect across-premises. As a result, IT can respond to business needs with greater agility and efficiency, and the mobile workforce is able to access personalized work environments from virtually anywhere. The Essentials Graphical User Interface is a role in Windows Server Standard 2012 R2 Work Folders - Synchronize and protect critical data with "Work Folders", a new feature that facilitates the BYOD (bring-your-own-device) trend by enabling users to access work files from their personal computers and devices. Organizations retain centralized control over that data and can specify device policies such as encryption and lock screen password. Data Deduplication; finding and removing duplication within data without compromising its fidelity or integrity Hyper-V Replica - Affordable disaster recovery, included in Windows Server 2012, makes an initial replica of virtual machines and then replicates any changes. Easily move workloads to new servers with no downtime Flexible, scalable storage; A cost-effective way to get the storage your business requires Centralized backup and remote access Networked file and print sharing Centralized storage and security of files Mobile user access to company data Windows Server 2012 Standard is for minimally virtualized environments. Every user or device accessing the server OS requires a CAL (Client Access License) One of the most comprehensive solution platforms for SMB Ideal solution for small businesses with multiple types of clients (laptops / devices / desktops / tablets) and remote end users. Users that require secure access to shared information, centralized file sharing, print services, and require remote access to company data from anywhere on any device.